Wow! I am simply overwhelmed by the “overwhelming” evidence against Oswald. But why don’t we, as serious assassination researchers, look into all the problems with the evidence. Let's begin with Oswald’s alleged ownership of the rifle. The rifle was a 6.5 mm, 40.2 inch long, Italian made Mannlicher Carcano rifle. Oswald allegedly ordered it from Klein’s sporting goods on March 12, 1963, under the name “Alek J Hidell”, where it was shipped to his PO Box (which was in his real name). · The money order in evidence was for a 36 inch rifle, yet they allegedly shipped Oswald a 40.2 inch rifle (even though Klein’s had 36 inch rifles in stock at the time, and didn't sell 40.2 inch rifles until April). Let’s also consider this: Why would Oswald use an alias (obviously to hide the fact that he was ordering a rifle), but then have it delivered to his PO Box under his real name? This makes no sense what so ever. The one other thing to consider is this: Hidell was not authorised to receive mail/packages at Oswald’s PO Box. In my post, Was Lee Harvey Oswald a complete moron?, I discussed the allegation made by former FBI agent Robert Barrett, about a wallet found at the Tippit murder scene which contained ID for both Oswald and Hidell. Barrett’s claim was confirmed by former DPD officer, Leonard Jez, who told researcher Martha Moyer that the wallet contained ID for Oswald. I also discussed how no mention of the Hidell name was made by anybody on day one of the investigation – despite the claims a fake selective service card bearing the name was allegedly found in Oswald’s wallet when he was arrested. Please see post for more info. Now despite all these problems, lone gunman zealots uphold one piece of evidence as “proof” that Oswald ordered the Mannlicher Carcano rifle – his handwriting on the money order. It is true that FBI experts identified the hand writing as belonging to Oswald, but couldn’t his handwriting be forged? Of course it could. Take for example the “Dear Mr Hunt Letter” The HSCA’s hand writing experts claimed it was a forgery. Hence, the writing on the money order could also easily have been a forgery. Also, let’s bear in mind that hand writing analysis is not an exact science. Although there is a great deal of evidence that Oswald didn’t, and couldn’t have ordered the rifle, it truly amazes how lone gunman kooks continue to uphold a highly questionable piece of evidence such as hand writing, as absolute proof that Oswald owned the rifle. For more information on the Oswald’s ownership of the rifle, be sure to check out Gil Jesus’s website here. One of the most important factors to take into account when assessing Oswald’s guilt is the fact that there is not a shred of evidence which indicates Oswald ever had possession of the rifle ammunition! Not that lone gunman kooks would tell you this, mind you. For example, no ammunition was found amongst Oswald’s possessions. There are also no witnesses at any ammo stores who recalled selling Oswald any ammunition, nor were any receipts discovered proving that Oswald bought the ammo. Could you tell us what exactly you did in testing those hulls for fingerprints? I used fingerprint powder, dusted them with the powder, a dark powder. No legible prints were found. With the evidence showing that Oswald didn’t own the rifle, and that he didn’t purchase the required ammunition, the case against him as the lone deranged assassin is severely undermined. The only alternative ways to explain his guilt is that he either stole both the rifle and ammunition, or he had a co-conspirator(s) who gave him the rifle with ammo, or the co-conspirator(s) brought the rifle into the depository. However, there is no evidence that Oswald stole either one. Hence, if Oswald was the assassin, there had to be at least one other person involved. Let’s now take a look at the fingerprints the DPD discovered on the rifle and the boxes forming the sniper’s nest. The examination of the boxes and the rifle was undertaken by Lieutenant Carl Day – the head of the DPD crime lab. According to Day’s Warren commission testimony, he discovered two prints on the magazine housing of the rifle, which he thought belonged to Oswald. He also examined the bolt of the rifle for prints, but was unable to find any prints on it. Did you dust the bolt for fingerprints? Before the live round was ejected? No, no; the only part that Captain Fritz touched was the round nob. I looked at it through a glass and decided there was not a print there, and it would be safe for him to open the bolt. Did you do anything with the other prints or partial prints that you said you thought you saw? I photographed them only. I did not try to lift them. Do you have those photographs, sir? I will mark the two photographs which you have just produced Commission Exhibits 720 and 721. I will ask you to state what these are. These are prints or pictures, I should say, of the latent--of the traces of prints on the side of the magazine housing of the gun No. C-2766. Were those prints in such condition as to be identifiable, if you know? No, sir; I could not make positive identification of these prints. Did you have enough opportunity to work and get these pictures or not? I worked with them, yes. I could not exclude all possibility as to identification. I thought I knew which they were, but I could not positively identify them. What was your opinion so far as it went as to whose they were? They appeared to be the right middle and right ring finger of Harvey Lee Oswald, Lee Harvey Oswald. So here we have Latona, claiming the fingerprints which Day had only thought belonged to Oswald, were of no value as far as he was concerned. Remember, according to Latona’s testimony, he had examined over a million finger prints during his career, so he knew exactly what he was talking about. With the fingerprints on the rifle being worthless, only the so-called palm print could positively link the rifle to Oswald. But before discussing the palm print, let’s take a look at the prints found on the boxes inside the sniper’s nest. The following photo shows the boxes forming the sniper’s nest. 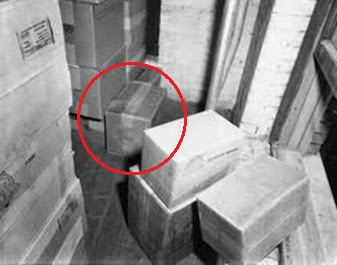 The two boxes stacked on top of each other in the middle of the photo, were allegedly used by Oswald as the gun rest. Now if the print could have been as old as three days, then it is hardly an incriminating piece of evidence. Let’s bear in mind that Oswald worked on the 6th floor as an order filler, so the presences of his prints on some of the boxes (even those near the window) are not necessarily proof of his guilt. Even the Warren commission admitted as much. Also, had Oswald sat on the box while filling out orders on his clip board, then the palm print could have been created then. Now if Oswald was truly guilty, then why weren’t any of his prints discovered on the bottom box, or on the box on top of the window sill? Perhaps he wore gloves, in which case the prints on the top would not have been created as he formed the sniper’s nest. If he didn’t wear gloves, then his prints should have been found on those boxes as well. It’s quite possible that any additional prints from Oswald were obliterated from the boxes, as they were handled by the authorities. Bear in mind that there were unidentified prints on the boxes. Those prints could very well have belonged to co-conspirators who didn’t wear any gloves. At best, the fingerprint and palm print evidence on the boxes are suggestive of Oswald’s guilt. The fact that lone gunman advocates continue to uphold the prints as incriminating, is yet another example of their narrow minded approach to the evidence. 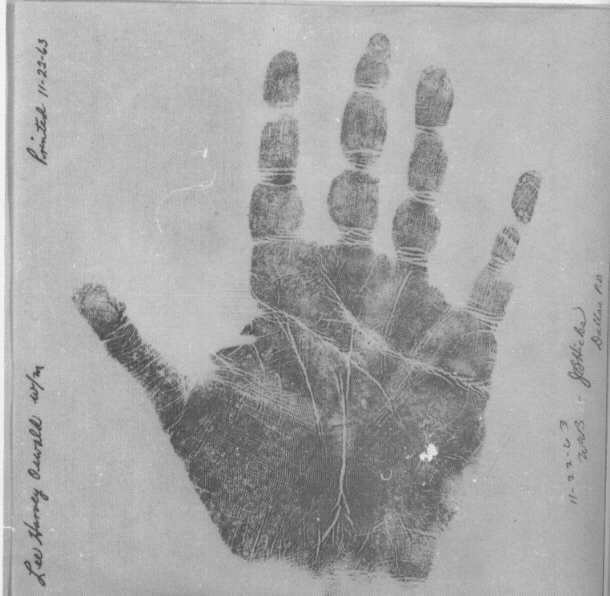 The one “solid” piece of evidence used by lone gunman theorists as proof of Oswald’s guilt is the palm print allegedly discovered by Lt Carl Day on the barrel of the rifle. However, it is one piece of evidence which has serious question marks concerning its legitimacy. The palm print issue has been discussed at length by countless researchers – most notably by Sylvia Meagher, in her the sterling book, Accessories after the fact. Now obviously if the print is not genuine, then the DPD were involved in framing Oswald for the assassination of the President. Lone gunman kooks assure us that the DPD would do no such thing. Well let’s consider why they would. First of all, the files released by Dallas DA Craig Watkins have revealed that under the tenure of then DA, Henry Wade, the DPD put over 20 innocent people in prison! So we know they were corrupt. One of the best examples is the case of James Lee Woodward. Woodward spent 27 years in prison for a murder which DNA testing has proven he didn’t commit! In fact, Wade’s office hid photographs from Woodward’s defence attorneys, which showed that the tyre marks from his car didn’t match those discovered at the murder scene. For more info, please see this article on the CTKA.net website. Secondly, the DPD had charged Oswald for murdering one of their fellow officers. Do lone gunman kooks honestly not think the DPD would manufacture evidence to get back at him? Of course they would. Let’s also consider this: Oswald was arrested in the Texas Theatre allegedly with a revolver. He left the TSBD following the assassination, where he then supposedly shot Officer JD Tippit whilst escaping. The DPD obviously had a viable suspect for both crimes. Now, do lone gunman theorists really think the DPD were going to go on a wild goose chase, looking for other suspects, when they had Oswald? Of course they weren’t. I honestly wonder whether lone gunman theorists actually understand the full magnitude of the Kennedy assassination. Kennedy was the President of the United States of America. Once the news of his assassination was announced, the entire United States and the leader of every civilised nation were anxiously waiting to learn who the culprit(s) were. In the year 1963 and before, the assassination of a sitting President was not considered a federal crime. So with the assassination under DPD jurisdiction, they were under the enormous burden to find the identities of the culprit(s). Obviously with Oswald as a viable suspect, they would charge him for the assassination – even if it meant assuring his guilt by manufacturing false evidence, such as the palm print! Bear in mind, that before the so-called backyard photographs of Oswald, and the money order for the rifle were discovered, both DPD chief Jesse Curry and District Attorney Henry Wade, had made it known to the media that they believed Oswald was the assassin. How about the palm print? The palm print again that I lifted appeared to be his right palm, but I didn't get to work enough on that to fully satisfy myself it was his palm. With a little more work I would have come up with the identification there. Is there anything else you did in connection with the rifle, the cartridges, the live cartridge, or the taking of prints from any of these metallic objects that you haven't talked about yet? No, sir; I believe that is the extent of the prints on any of those articles. Did you make a positive identification of any palm print or fingerprint? Not off the rifle or slug at that time. At any other time did you off the rifle or the slugs? When you are saying you looked at that thing today, to what are you referring? Your No. 637 is the right palm of Oswald. Handing you what has been marked "Exhibit 629" I ask you to state if you know what this is. That is the right palm of Lee Harvey Oswald. Do you know where this print was taken? Yes, sir; it was taken by Detective J. B. Hicks in Captain Fritz' office on November 22, 1963. Did you take more than one right palm print on that day, if you know? Yes, sir; we took two, actually we took three. Two of them were taken in Captain Fritz' office, and one set which I witnessed taking myself in the identification bureau. Any particular reason why you took more than one? In most cases, when making comparisons, we will take at least two to insure we have a good clear print of the entire palm. As we can see, Lt Day identified the palm print he allegedly lifted off the barrel of the rifle, as being that of Oswald’s right palm. However, there are many reasons to believe that Day was lying. First of all, Day was alone when he “discovered” the print – so there is absolutely no corroboration for his discovery. Secondly, although he photographed the two latent finger prints he found on the rifle, he neglected to photograph the palm print. 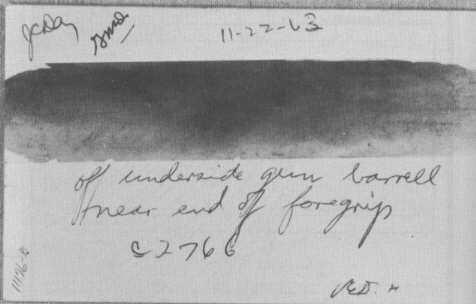 As Sylvia Meagher explained, Day claimed that he neglected to photograph the print, because he received orders from Chief Curry to stop working on the rifle. However, this was a lie! According to his testimony, Day photographed the two latent finger prints at 8:00 pm. During his interview with the FBI, he informed them that he received orders from Chief Curry to stop working on the rifle shortly before midnight. Now if Day photographed the prints at 8:00 pm as he claimed, then he had ample time to also photograph the palm print. His excuse for failing to photograph the print is therefore a lie. Unless of course we are to believe that “shortly before midnight”, actually meant at 8:00 pm. completely ridiculous! We had no personal knowledge of any palm print having been developed on the rifle. The only prints that we knew of were the fragmentary prints which I previously pointed out had been indicated by the cellophane on the trigger guard. There was no indication on this rifle as to the existence of any other prints. This print which indicates it came from the underside of the gun barrel, evidently the lifting had been so complete that there was nothing left to show any marking on the gun itself as to the existence of such even an attempt on the part of anyone else to process the rifle. So that you personally, Mr. Latona, did not know anything about a print being on the rifle which was identifiable until you received, actually received the lift, Exhibit 637? On the 29th of November. Seven days after the assassination. And in the intervening period, correspondingly, the FBI had no such knowledge? With no trace of the print being discovered on the barrel of the rifle, and with not a single photograph taken of the print on the barrel, there is simply proof the print was ever on the barrel as Lt Day claimed. However, the most truly bizarre episode surrounding the print, as Latona informed the Warren commission, is the fact that the FBI had received the print on the 29th of November (a full week following the assassination)! Now most people would consider this to be truly odd, but not as far as lone gunman zealots are concerned. Latona eventually identified the palm print as being that of Oswald’s right palm. His findings were confirmed by Arthur Mandella (a finger print expert with the New York police dept.) and by another FBI fingerprint expert, Ronald G Wittmus. However, given that there are no photographs of the print on the rifle, no corroboration for Day’s lifting of the print, the lies Day told, and the fact the FBI received the print a full week following the assassination, there is simply no reason to believe Oswald ever left a print on the rifle. But if that’s not enough to convince you that there was no palm print, then just consider this: There was no mention of any palm print during the first two days of the investigation, by anybody! (It reminds me of the Hidell ID). 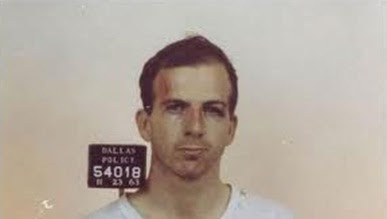 In fact, the first mention of it was made during a press conference held by Henry Wade on the evening of the 24th of November – after Oswald was killed by Jack Ruby. In 1993, latent fingerprint examiner, Vincent Scalese, allegedly identified the latent fingerprints on the magazine housing of the MC rifle (which Carl Day first discovered), as positively belonging to Oswald. Warren commission defenders have in turn upheld this as positive proof of Oswald’s guilt. However, the recent studies on fingerprint identification have rendered this conclusion to be false. After having re-read this post, I realised I neglected to mention the fact that no cleaning equipment for a gun was found amongst Oswald's belongings. Has anyone mentioned how Oswald shot his rifle- right-handed vs. left-handed? If he shot right-handed, then his left palm is obviously under the weapon. Would this make a right-handed print irrelevant? Has the Zapruder film been altered?